Hello everyone! I’m going to take an intermission from my El Nido posts. I’ll be posting about them very soon, I am just waiting for the other pictures to be sent to me plus I’m meeting a deadline this week for my high school yearbook. My fingers are crossed that it’ll turn out pretty well! The hottest movie of the summer would probably be Iron Man III! I was jelly of my friends who have seen my hot, superhero slash boyfriend (Sorry, Pepper Potts, I was first.) on the large screen ahead of me since I was out of town. 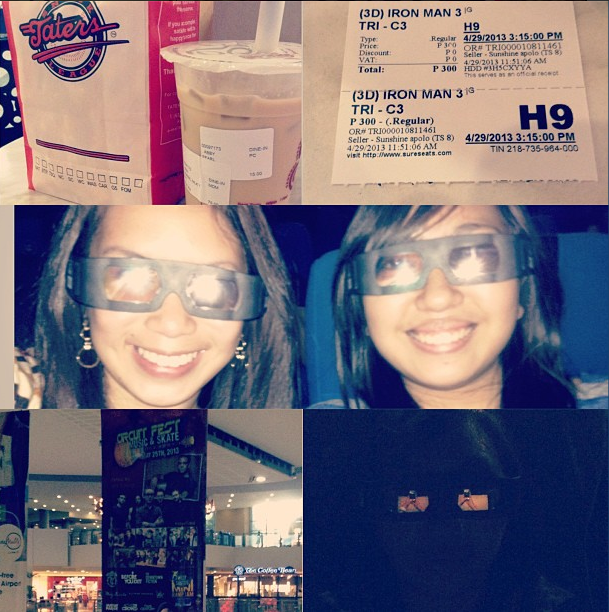 The wait was finally over when my high school best friend Anna accompanied me to see the movie this afternoon. Yay! I’d hate to burst the bubble of those who haven’t seen it yet, but I’m telling you, Anna and I are giving the movie a two thumbs up! We watched it in 3D, maybe you ladies would enjoy watching the movie more as Tony Stark swoons you with his appealing looks and mad moves, making it appear more ‘realistic’. This is what I wore to today’s date with Iron Man!! I mean .. Anna. Ysabel’s ‘Harmless Fashion Rule’ # 1 –Wearing the same accessories over and over. Fashion is meant to be recycled depending on the trend – plus when, where and how you’re going to wear them! I don’t think I’ll be able to be savvy with my moolah if I shop for new clothes, shoes and accessories all the time! Ysabel’s ‘Harmless Fashion Rule’ # 2 – Purchasing ‘non-labeled’ pieces. Even the prettiest accesories can be found in bazaars, thus can create good bargains. I look more on the quality of the item rather than the label. Ysabel’s ‘Harmless Fashion Rule’ # 3 – Clothes/items swapping. Since the only sister I have is my mom and for a fact that she’s very much into fashion, we swap pieces. She borrows my blouse, I borrow her bag. She borrows my pants, I borrow her bracelets. It’s nice having a touch of her own style in her closet. Swapping also saves money and time! 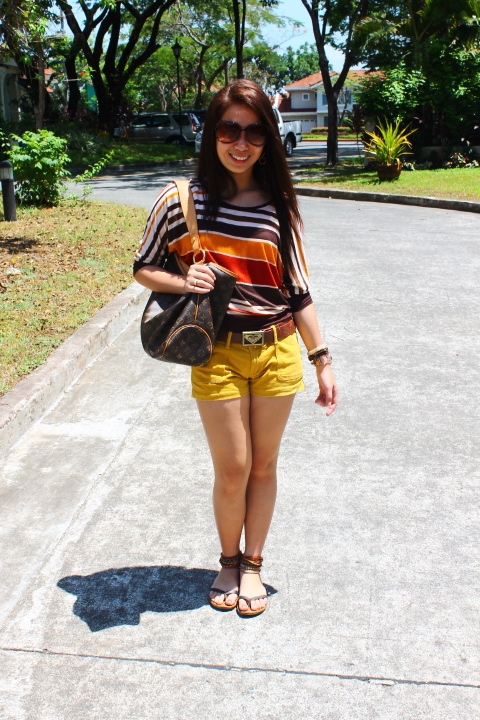 Ysabel’s ‘Harmless Fashion Rule’ #4 – Wearing clothes of the same brand at the same time. What I’m wearing is actually an ensemble I bought from Papaya, one of my favorite clothing stores in the US. I’m loving brown and margarine together. Ysabel’s ‘Harmless Fashion Rule’ #5 – Topping your outfit off with the basics. 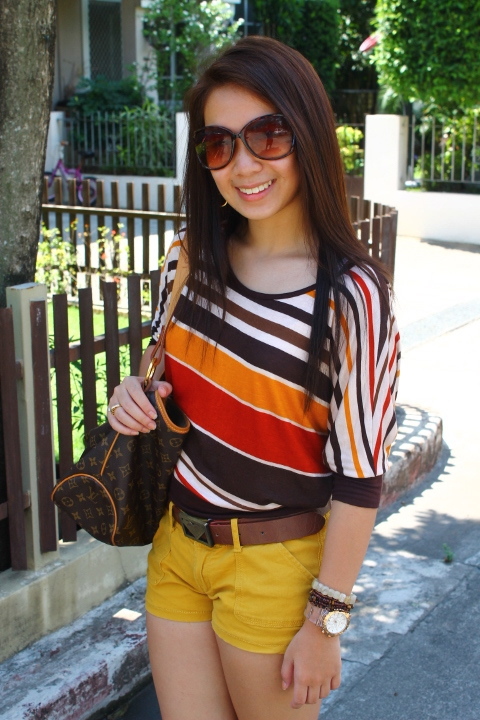 In my previous outfit post, I wore brown too! The pieces you have in your closet coated in these colors (or shades) are your fashion fundamentals. It’s okay to play with the color palette but these staples, white, black and brown, can never go wrong and can be fitting for any occasion. Reposted from my best friend Anna! In order for you to get a 2GB Iron Man USB, you must first purchase an Iron Man limited shirt of F&H worth P999.00. 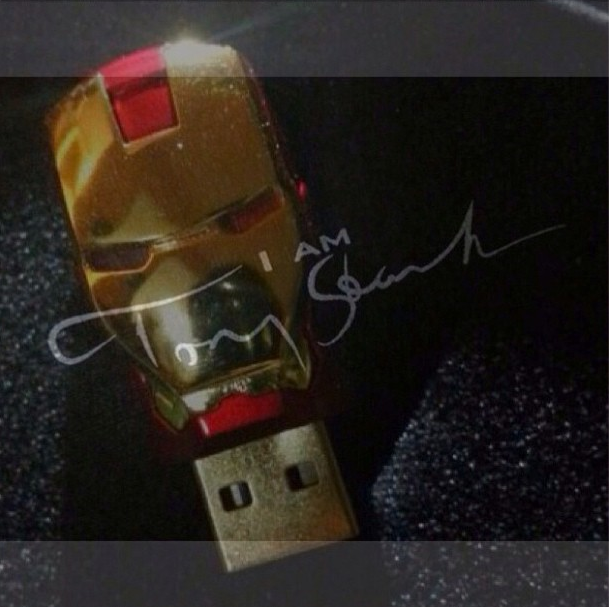 The Iron Man USB comes with it! I got this for my brother who’s turning 13 this May. I was lucky enough to buy the shirt I picked out for him – it’s the last size, last design, last color. Phew!